Great web site! I’m currently working on a finished attic that’ll eventually have a 50’s retro themed home theatre (14′ x 24′) with a small connected retro-themed diner (10′ x 10′). I’m currently looking for a few retro items. Here’s a short list. Please provide any suggestions / sources / ideas you have. Thanks for your help. On attic renovations in general, the photos at the top (click on thumbnail to enlarge) are particularly appealing to me. See how they use all the nooks, crannies and sloping ceiling of the attic effectively — see the bunkbeds tucked in behind the TV in the lead photo, for example. So cool! 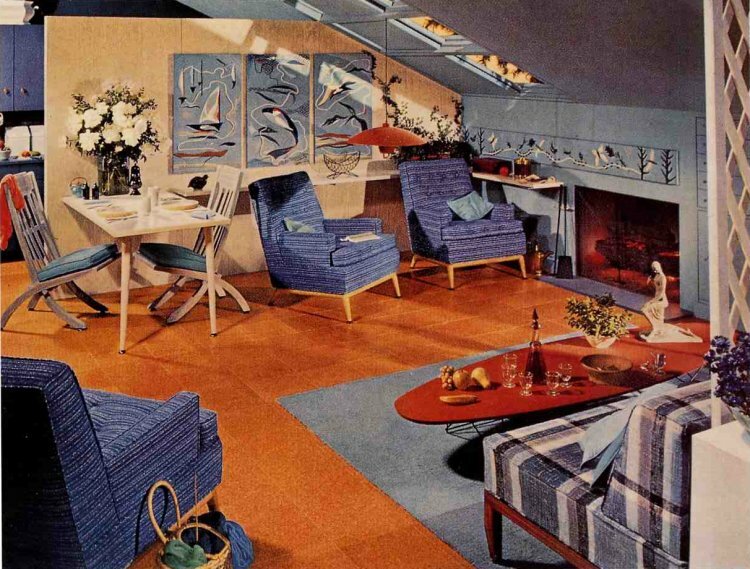 This is what makes attic retro renovation particularly appealing to contemplate. Mine is ripe for this, it’s empty right now! 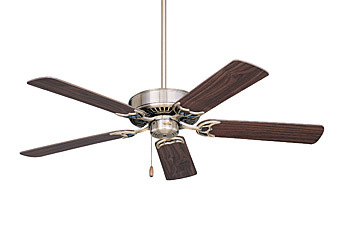 Retro ceiling fans: I like these Emerson Traditional Ceiling Fans. 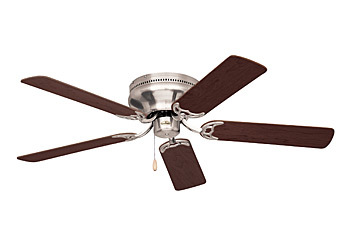 They are simple in design ala fans of the early 20th century — and you can get fans that either hug the ceiling (Snugger models– I really like these!) or which drop down. Honestly, I don’t care much for the way they look with lights attached. I think it’s better to have task lighting — lamps — or sconces. Hey, how about some vintage pole or cone lamps? They can really help make a room. 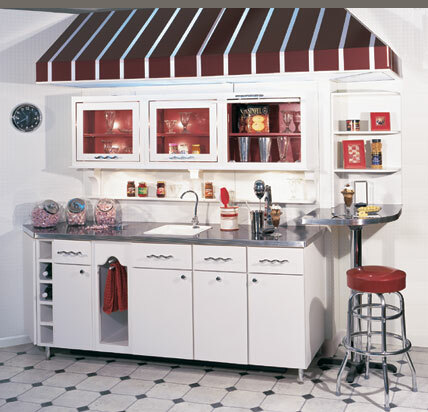 Retro metal cabinets:First of all, see the photo from Omega showing how they’ve created a malt-shop feel with their slab-door wood cabinets. You can replicate this with wood or metal cabinets. But I think the awning used as an interior design element is inspired and is what really makes the space! Be sure to ‘tie’ the awning color to your accent color scheme, as has been done here. And see how they paint the back of the glass-front wall cabinets dark red (and the stool, and the towel and the boxes)? These little punches of color make all the difference – they help your eye “dance around” a given space. But don’t overdo it either – see how the stainless countertop is a calming anchor? And, even consider a ‘wanted’ ad in your local paper. New. Try Lee Industries’ Apartment Sofa Model 3052 at the right, and two coordinating chairs or similarly styled recliners. 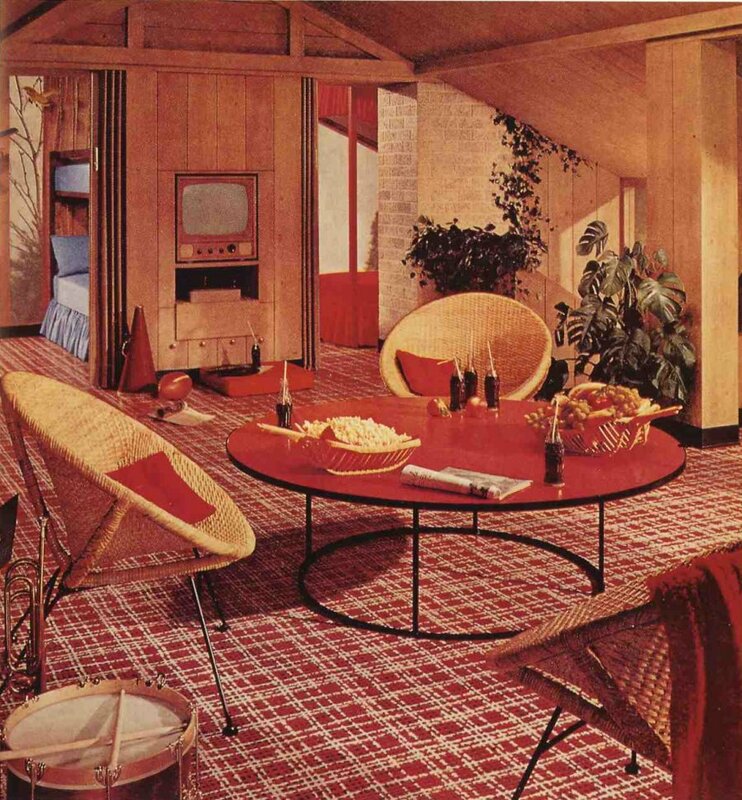 I really love this sofa, actually, for a postwar 40s 50s or 60s interior. 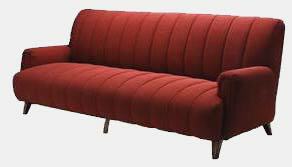 The low arms and tight upholstered back with piping up the middle are perfect (very similar to my vintage sofa)…I also like the skirt. This one is a winner. 100% Vintage Design – but New. Check out Heywood-Wakefield, which still makes two styles of vintage retro sofas, along with coordinating club chairs. New — with the original look, including a nice range of upholstery choices — the best of both worlds, in many respects?